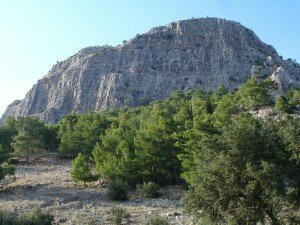 When I first went to the ruins of the ancient city of Priene, Turkey, I was mesmerized by the high cliff that is the backdrop for the city. We were told that there was an ancient set of steps that had been carved into the cliff face, allowing you to go all the way to the top. Our leader and guide for the trip, Ray VanderLaan and his son Jeff, had actually made the ascent and were saying what a tough, but awesome experience it was to climb all the way to the top. I left there wondering if I could make that climb at my age and what it would be like. 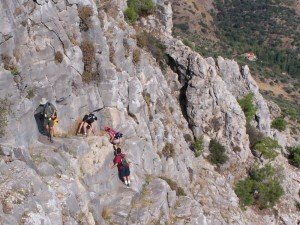 Every time I would look at the cliff in my pictures, I would think about that climb. Four years later I learned that I would again be going to Turkey on a study trip. One of the first things that came to my mind when I learned that I would be going again, was the acropolis at Priene. I knew that RVL would lead a group to the top. Would I be one of them? As I exercised and prepared for the trip, the picture of the cliff was always in my mind. I wanted to successfully make that climb. It was like a carrot dangling out in front of me to keep me motivated and get in shape. On the eighth day of our trip I got to see Priene and the acropolis again. I had a hard time listening to the faith lessons because I knew what would be happening at the end of the day. As we finished our last session, RVL issued a command,”Let’s go-come follow me” and we climbed up out of the ruins and started up the steep incline towards the cliff face. The trip to the top was a lifetime experience for me. It was by far the toughest vertical climb of the trip and was my personal hardest hike up to that point. Although it was a struggle, I made it to the top in good shape. However, I watched many people really struggle with the climb. Fear of heights and drop offs plagued several people and many tears were shed as we hugged the wall up the narrow trail. Bad knees and age also hampered quite a few. But, by God’s grace, we all made it to the top together. Once on top, we got as close to the edge as we dared and took pictures of Priene and the valley below. If you look at the cliff from below, it looks impossible to climb. The cliff face is sheer, vertical and huge. It looks as if only a technical climber with specialized equipment could scale it. But, we had a guide that had already taken the path before and knew the way to the top. We got to our destination by following our guide and watching the feet of the person ahead of us. What a great life lesson this is. If you look at the huge cliff as a whole, it looks impossible, but by taking one step at a time, behind our guide, we made it to the top. Another lesson we learned while at the top, was to look at things from God’s perspective. It was a common practice of the ancient rabbis to take their disciples up on a high mountain and let them look below at an advancing army or a city and see how small everything looked. When you are down on the ground floor looking at a problem, it looks pretty imposing. But, when you are looking at it from a heavenly perspective, it’s not that big. It was a huge faith builder for me to think of God in the heavens, looking down at my problems and seeing his perspective on it. Vast armies don’t look that big when you are looking from a high vantage point. To sum up this lesson, I learned that if I will just start the journey and be strong and courageous (Joshua 1), I will be surprised at how well I will do. If I don’t get caught up in the overwhelming bigness of the situation and just keep following the ones who have gone ahead and already know the way, I will make it just fine. I just need to follow my guide, Rabbi Jesus and try to think of things from His perspective. He will take me safely to my destination. In the words of the popular Christian song, “He’s bigger than all my problems, bigger than all my fears. God is bigger than any mountain that I can or cannot see. He’s bigger than all my questions, bigger than anything. God is bigger than any mountain that I can or cannot see”. Read these verses Acts 20:13-37; Ezekiel 3:17-19 before looking at this week’s post. 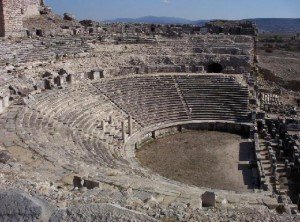 Most people who visit the country of Turkey make it a point to go to the fabulous ruins of the seaport and biblical city of Ephesus. However, not many tourists make the fifty mile trip south of Ephesus to visit another biblical city, the ancient port city of Miletus. Paul was here, as found in Acts 20 and also 2 Timothy 4:20. Paul sent for all the elders of the church in Ephesus to meet him in Miletus. This was at the end of Paul’s 3rd missionary journey. Paul had spent several years in Ephesus and been through lots of trials and difficulties with the believers there. He realized that he was about to be imprisoned and that he would never see these people that he loved, again. When the leaders arrived, Paul began to speak to them in Acts 20:18 and tell them that he has done his best to teach them and that he has nothing to be ashamed of and that he has given them everything that he had. Paul was saying that he had left it all on the field and he had no regrets. 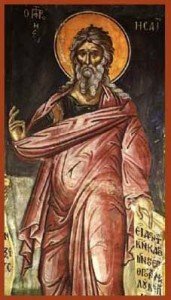 Because Paul was a well versed student of the Hebrew Testament, he knew the story in Ezekiel 3:17-19 where God had warned his prophets, ”you tell them and if they don’t listen, it’s their fault. If you don’t tell them and warn them, then it’s your fault; their blood is on your hands”. Evidently, drawing from this passage, Paul tells the leaders of Ephesus, “I am innocent of the blood of all men”. He had boldly proclaimed the gospel to everyone that he had come in contact with. He had warned everyone in Ephesus and the surrounding area. 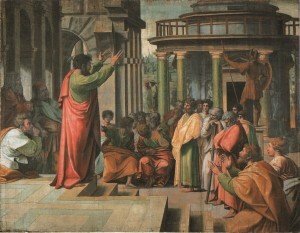 In fact, Acts 19:10 says, concerning Paul’s preaching, ”This went on for two years,so that all the Jews and Greeks who lived in the province of Asia heard the word of the Lord”. Where do you and I stand in this regard? Are we innocent of the blood of all the men that we have come into contact with? Obviously, we need to start at home, tell our children and our children’s children. What about the people that we work with? There are so many people that we come into contact with that have no idea about the claims of the gospel and the eternal implications that they bring. Lord, give me (us) the boldness to proclaim the good news of the gospel to everyone that I (we) interact with. Let them see you and your nature in our speech and actions. Let us be so bold and passionate that we too, are innocent of the blood of all the men that we have talked to. 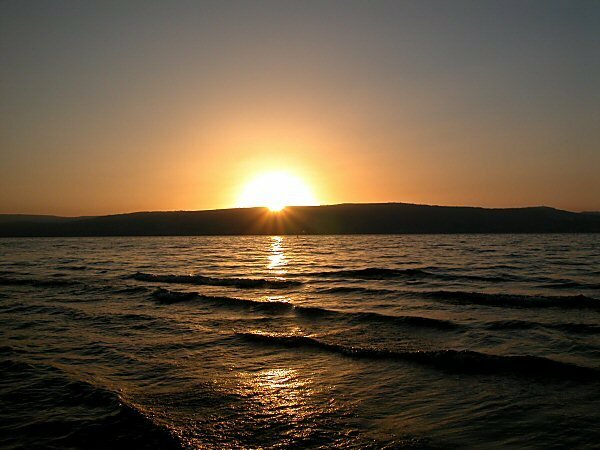 There was a rabbi living in the village of Capernaum, Israel, on the shore of the Sea of Galilee, during the first century A.D. Late one evening, he was walking the path along the shore of the lake near the village. As rabbis are accustomed to doing, he was talking out loud to God and mulling over the Hebrew text. Absorbed in this deep theological discussion, he completely lost track of the time of day and where he was on the path. As the light of day began to fade, the rabbi failed to notice the upcoming fork in the road. Instead of taking the trail back to the village, he took the path that led to the Roman garrison that was located nearby. Capernaum was on the main branch of the ancient highway (called the Via Maris) that led to the Mediterranean Sea and eventually down to Egypt. Hundreds of thousands of travelers came on this route each year. Consequently, the Romans kept a big presence here to collect duties and protect their interest in this small, but very important country. The rabbi was a very wise man and he knew the importance of these two questions. In fact, these are questions for the ages and are relevant to every generation. Each one of us should be well aware of what our answers to these questions should be. Who are we? What are we doing here? Who are we in God’s eyes and what is our relationship with him? What is our purpose?Why does God still have us here on this earth? What does he want us to do with the precious time that we have left? Like the rabbi, wouldn’t these be great questions to ask ourselves each morning as we wake up and start our day? The sovereign Lord has given me a teacher’s tongue, to know the Word that sustains the weary. Morning by morning he awakens me and chisels out the stone from my ears, so that I may listen like one being taught. I had never seen this verse in Isaiah until I heard it read on the first day of our trip to Asia Minor. After arriving in Turkey, we went immediately to our first location and received some background information on the apostles that came here and the stories in the New Testament that took place in this fascinating land. Jesus’ disciples took his command to go to the ends of the earth and make disciples literally and came here to live among the most pagan culture in the world, spreading the gospel of Jesus Christ. 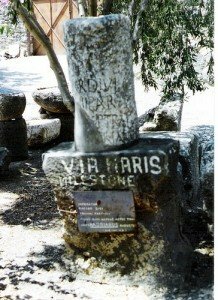 Names such as Ephesus (Ephesians), Colossae (Colossians) Galatia (Galatians), and the seven churches in Revelation (Smryna, Pergamum, Thyatira, Sardis, Philadelphia and Laodicea, (along with Ephesus) were all located here. We were told several stories of how they were persecuted and gave up their lives, as well as their families lives, for the spread of the gospel. Our guide read this verse from Isaiah and challenged us with the question, “Why are you here on this earth? Why does God still have you here? What is your purpose?” Here is at least part of the answer. If we are one of Jesus’ disciples, we have been given the heart and voice of a teacher to proclaim God’s Word to the weary. We know what they need! He has chosen our voice to use as His instrument to make Him known. He has already given us the ability to teach and to help someone who is hurting. He will show you what to say and do in every situation if…you let Him awaken you every morning and let Him speak to you and teach you what He wants you to know from His Word. The most accurate translation of the last part of the verse is that He is “chiseling the stone out of my ears, so that I can listen like one being taught”. He is shaping and chiseling us as we read and learn from the Text. Our ears are filled full each day from the pagan world that we live in. We need to have God chiseling the bad things out of our thinking and replacing it with His very words to us. Whatever you read each morning, you will need somewhere along the line. It might not be used that day, but God is showing it to you because one of these days you will need it. What if we don’t let Him chisel? What if we don’t read? “He who has an ear, let him hear”. In Hebrew, that phrase means, “Do It!”, or as we like to say here in the Southwest, “Get er done!” How could we do any less, considering what He has done for us?